A ground-breaking new Canadian advisory uncovers exceptional opportunities for informed investors. AND YOU CAN SAVE OVER $250.00 ON OUR SPECIAL INTRODUCTORY OFFER! “Spinoffs are the closest thing to a sure thing you can find in investing.” As a conservative investor, I rarely make statements like that. But I make this one for a very good reason. Spinoff after spinoff has generated soaring profits for investors. And we have made the right call at the right time over and over again with these opportunities. And here’s the best part. Spinoffs come at a perfect time for investors to get in on the action. When companies spin off a division or subsidiary, they do it because they know there’s value there. And both the spinoff and parent company consistently outperform comparable stocks, often for years. But that’s not all. A successful spinoff often has the right characteristics (good management, niche market, steady revenue, etc.) to make it an ideal takeover target. You know how that pays off for investors—a run-up in the share price capped by a big takeover premium when the acquisition is completed. And the story keeps getting better. You can uncover these big profits at an early stage. Activist investors frequently serve as the spur to a spinoff. Armed with a strong stake in a company, they push management to trim the fat, unlock hidden value and spin off valuable assets. Read on and you’ll see some eye-opening examples of spinoffs, takeovers and activist involvement we have recommended that gave our subscribers early notice of big gains. We do draw the line. Among “special situations” as they’re often called, there is one we usually avoid. And it’s generally the most hyped “situation” of them all. Initial public offerings, or IPOs, come to the market with plenty of fanfare fuelled by company insiders and sponsoring brokerages. They typically appear at a great time for insiders to sell, which means it’s generally not a good time for you to buy. It’s not unusual for an IPO to shoot up to great acclaim when it’s released, then just as quickly take a brutal fall. Yet we never reject a good investment opportunity, and by dint of careful research we have found a few IPOs that we like—and have done very well for our subscribers. A little later on, you’ll see two glowing exceptions to our rule. You can get early opportunities to profit from spinoffs, takeovers and other special situations—yes, even the rare attractive IPO—when they arise. For years we have uncovered these exceptional opportunities in our investment advisories: The Successful Investor, Stock Pickers Digest, Canadian Wealth Advisor, Wall Street Stock Forecaster and most recently, TSI Dividend Advisor. And readers have been urging us to come up with more of these spectacular opportunities. What’s more, many successful hedge fund and portfolio managers follow the same criteria we do—and often snap up stocks well after we put a buy on them. Now it’s your turn. We are launching a special advisory that deals exclusively with these exceptional investment situations. It is the only one of its kind in Canada, if not on the entire planet. It is called Spinoffs, Takeovers and Special Situations. We will cover all of the special circumstances that can bring enormous profits to those who are aware of them. In the process, we will cover many stocks that have never been featured in our five investment advisories. When companies create spinoffs, informed investors profit. A company sets up one of its subsidiaries or divisions as a separate company, then hands out shares in the new company to its own shareholders. They could be a special dividend, or give shareholders the option of swapping shares of the parent company for shares of the new spinoff. You get a double opportunity to profit. Time and again, the spinoff company and the parent both outperform groups of comparable stocks for years (see box below). And when you buy into a spinoff based on careful research like ours, you get a remarkably low-risk investment. Spinoffs tend to outperform other stocks in their category by a wide margin, and often attract extraordinary takeover bids. But even if they don’t get quite that far initially, you still have a very good investment on your hands. It’s a clear case of heads you win, tails you break even. Research has shown that spinoff and parent companies consistently outperform benchmarks (the MSCI World Index or S&P 500) and their industry peers by about 10 per cent per year. Studies in recent years from sources such as Deloitte, the Journal of Financial Economics, the Journal of Portfolio Management and Credit Suisse display a similar pattern. Both parent and spinoff may lag below the benchmark index in the first month, but then rise above the index and continue upward. Fording Canadian Coal Trust was one of five spinoffs from the original Canadian Pacific Railway Ltd. When we recommended it in January 2008, it was trading at $47. We liked its prospects as a major metallurgical coal producer for steelmaking, and its steady cash distributions to shareholders. And we liked its appeal as a takeover candidate. Not long after we recommended it, Teck Cominco (now Teck Resources) launched a takeover bid that pushed Fording’s shares up 162.3% in five months! CP Rail was another of those five CP spinoffs (CP Ships, CP Hotels and Pan Canadian Energy were the other three). In 2012, we foresaw opportunity arising with the input of an activist investor, Pershing Square Capital, which pushed CP Rail to replace seven of its 16 directors and bring in Hunter Harrison as CEO. We made CP Rail our Stock of the Year in The Successful Investor. While many broker and media observers underrated the stock, we saw a great deal of hidden value in its unused assets. The new CEO unlocked those assets and spurred the company to new efficiencies. The stock soared 230.4% over the next two years. If you’ve followed our advice, you know how much we prize hidden value, assets that are not visible on the balance sheet, but are all the more potent for that. It could be unexploited real estate, a commitment to productive research, a loyal following open to new products, a reputation that helps secure new business, a respected brand name. Broadridge Financial Solutions contained a wealth of hidden value that prompted Automatic Data Processing to spin it off in 2007. It works behind the scenes in the investment industry, processing securities, clearing transactions, and handling investor communications. We saw the potential immediately, and kept the stock while it rode out the economic crisis that began in 2007. It has risen 267% over the past five years. One of the three top commercial real estate firms in the world¸ Colliers International Group was founded in Australia but ultimately established its head office in Toronto. In 2015, it became two public companies. Colliers International concentrated on commercial properties while FirstService Corp. focused on the residential side of the business. Two years after the split, FirstService had risen by 136.7% and Colliers by 52.5%. What we saw here was not the potential to cash in on any particular real estate trend or “boom”, but two companies with the experience and scope to succeed in different real estate markets around the globe. A new threat faces businesses, governments and individuals in the 21st century: cyberattack. Even before the dawn of the new millennium, we liked security software specialist Symantec, making it a buy in 1999. In the ever-shifting tech world of the 1990s, Symantec was the subject of several mergers and spinoffs. Its best move was the acquisition of Norton, which soon became synonymous with anti-virus software. Several years ago, we saw a spinoff in the works as Symantec looked to divide its security and information management divisions. In fact, the management information group, Veritas, went to a private equity group. After the sale, Symantec rewarded investors to the tune of over $5 billion with share buybacks and a special dividend of $4 a share. It pays to follow spinoff opportunities wherever they lead. In the meantime, accounting for three 2-for-1 stock splits, Symantec is up more than 900% since we recommended it. Mentor Graphics fit our criteria for a rising growth stock—a company that was making systems to improve the design and speed the development of electronic products (with many clients in the auto industry). It also fit the criteria of an appealing takeover candidate. In October 2016, a year after we made it a buy, Mentor jumped 7% after activist investor group Elliott Management Corp. revealed that it had doubled its stake in the company. Elliott had a record of coaxing smaller firms into the arms of bigger ones. And just a month later, German conglomerate AG Siemens bid for Mentor, and completed the all-cash takeover in April. In the brief period between the bid and the takeover, the stock jumped 50.8%. These special opportunities come in many different forms. It takes a practiced eye to spot them as they develop. And the secret of success is built right into our research. Our systematic approach uncovers every aspect of a company’s finances, operations and management. And it runs deeper still. As we get to know a company from the ground up, we see opportunity before it unfolds. Many times, we have predicted special situations that have let our subscribers get in on the “ground floor” of remarkable growth spurts. When Wendy’s International launched Tim Hortons as a new issue in 2006, we made it a buy right away. But that’s not all. Many investors saw it as just another entry in the long line of donut shops, burger joints and other fast food outlets that were popping up in shopping strips across the country. We saw something very different. We saw a growing Canadian institution, carrying the name of the hockey legend who launched it, and developed by management that understood the Canadian market. The company’s menu, key locations and marketing all worked to make it an essential stop for hockey parents and other busy travellers, and a congenial meeting place in cities and towns across the country. “Tims” became much more than just a coffee shop. The stock fulfilled the promise of its popularity, making big gains for our subscribers for eight years. And when Burger King acquired it in 2014 it rewarded investors with a 53% jump in two months and a rich takeover premium. More recently, we found a Canadian stock that “has made a lot of progress in the year and a half since it became a public company.” It is in the right place with the right business, designing software for retailers. And Shopify has the right software for them. It gives merchants a real-time snapshot of their entire business, including inventory, shipping and payments. That includes a successful new Chip and Swipe wireless card reader it recently introduced in the U.S.
From the time we made the stock a buy in January 2017, the shares have gained 82.7%. Few IPOs earn our recommendation, but we review them steadily, so we’re ready to get behind the few that soar for investors. My editorial team and I continue to sift through thousands of stocks, digging deeply to discover which are ripe for spinoffs—and which spun off stocks may be in line for takeovers. We are carefully monitoring stocks that have drawn the attention of activist investors. Spinoffs, Takeovers and Special Situations will show you every special situation you can profit from in the months and years ahead. We will also warn you about those that could be “value traps” for uninformed investors. Spinoffs—the creation of an independent company through the sale or distribution of new shares of an existing business or division of a parent company. Experience shows that both parent and spinoff consistently outperform comparable stocks. One study by the Journal of Financial Economics found that spinoff stocks have an average return of close to 19% per year, as opposed to 9% to 10% for all stocks. Takeovers (with our Takeover Target Rating). When an acquiring company makes a bid to assume control of a target company, it often pays a high price to buy a majority stake. Takeovers consistently offer a windfall to investors holding the shares of the target stock. Both spinoffs and parents experience an unusually high incidence of takeovers, says a Journal of Financial Economics study. You can see several of the key factors we use for our Takeover Target Ratings for spinoffs in the box below. Spinoffs can create the prospect of takeovers that serve as a windfall for investors. And we have created an exclusive proprietary rating system—our Takeover Target Rating—that will alert you to these rare but highly profitable opportunities. Operates in a consolidating industry, which enhances its appeal for competitors seeking economies of scale. The company has good management/industry experts that the buyer can put to more profitable use. Profit margins are lower than industry norms. That leaves room for the buyer to cut costs and improve profits. Activist investors—an individual or group buying large numbers of a company’s shares often to obtain seats on the company’s board and effect a major change in the company. When activists take hold, new growth is often in store—and we alert investors to the benefits ahead. Activist investing has surged in the past decade, led by a relatively small but powerful group of activist hedge funds. They follow different strategies, but all have the same goal of wringing the greatest possible profits from the company’s assets. IPOs—or Initial Public Offerings: the first time a company’s stock is offered to the public. IPOs are generally issued at a time when it’s best for insiders to sell, which is not usually the best time for you to buy. But from time to time, a new issue comes to market that our research shows is just right for our subscribers—and we don’t miss it. See Tim Hortons and Shopify, above. Let me say it again. In this new, ground-breaking advisory we expand our universe to cover many more stocks that have never been featured in any of our five investment advisories. And to help get you started, we have three Premium Reports that give you clear explanations, insights and specific recommendations on all of the different special situations investors can profit from. These reports are yours FREE when you accept our special introductory offer to Spinoffs, Takeovers and Special Situations. “The parent company starts by selling a portion of the new company to the public, to establish a market and a following among investors. That way, by the time of the spin-off, stock in the new company may be liquid enough to be sold relatively easily, or retained with some confidence as a worthwhile investment. In our experience, this helps the parent and the spin-off. Both generally do better than comparable companies for at least several years after the spin-off takes place. “To help investors judge the likelihood of the takeover of a recent spinoff, or even its former parent company, we zero in on 13 factors that enhance its appeal to potential buyers. “A good way to zero in on companies that would benefit from selling or spinning off one or more of their businesses is to follow activist investors. Spinoffs, Takeovers and Special Situations is much more than fascinating reading for informed investors. It also opens the door to profits few investors will ever realize. AND now let me explain the remarkable introductory offer I have for you. This Canadian advisory represents a unique and invaluable resource, the culmination of years of successful recommendations and the beginning of new opportunities for investors like you. Up to now, Canadians seeking to penetrate this specialized area of investing were largely restricted to the high-powered, high-priced route of hedge fund management. A process costing thousands of dollars (and running the risk of considerable losses). And as I said earlier, many top hedge fund and portfolio managers use the same criteria as we do—and frequently tap into the same opportunities well after we have recommended them! Now investors have a real choice—a much better, more accessible way to profit from these opportunities as they arise. Our expertise in these special situations is now concentrated in one ground-breaking newsletter. Spinoffs, Takeovers and Special Situations is issued 12 times a year. It is supplemented by regular Hotline Updates from our investment team as they follow special situations and developing investment opportunities. It would take a great deal of time, effort and money to track down this advice elsewhere. You can’t expect advisors or brokerages to have the comprehensive view of spinoffs and special situations we have acquired. At best, a few isolated examples might surface in their research departments. You could delve into some special situations through hedge funds—but that would require a lot of money poured into complicated strategies that can unravel in a hurry. It’s expensive and potentially very dangerous. 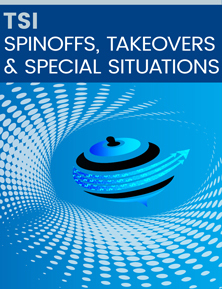 Or you can get clear, valuable insights on how to profit from the full spectrum of special situations in Spinoffs, Takeovers and Special Situations. And the regular annual subscription rate is only $797. But you don’t even have to pay that. If you act now, you can have a special introductory rate. As an introductory subscriber, you are entitled to receive Spinoffs, Takeovers and Special Situations for just $44.97 a month. That’s correct. YOU SAVE over $250.00 for full digital delivery of this one-of-a-kind advisory. And you get our three, ground-breaking reports Why Spinoffs are Superior to IPOs, How our Takeover Target Rating Can Make You Money and Follow the Activists. These 3 Premium Reports alone—an additional total value of $77.00—will give you valuable insights into special and very profitable investment situations. Please take advantage of this generous introductory offer now. You could be in line for the greatest gains you have ever experienced. I look forward to hearing from you as soon as possible. We look forward to helping you uncover profits that few Canadian investors will ever see.